This is the newest year ever! 2016 is brand spankin’ new. I hope your greeting from the 1st day of January this year was a friendly one. Our drive north yesterday, with Delilah along for her first long car trip, went better than we imagined it might. She did great. She settled in amazingly well at the cabin of our good friends, Barb & Mike Wilkus. It helps that Mike is especially good with dogs, greeting her with a treat, right from the start. 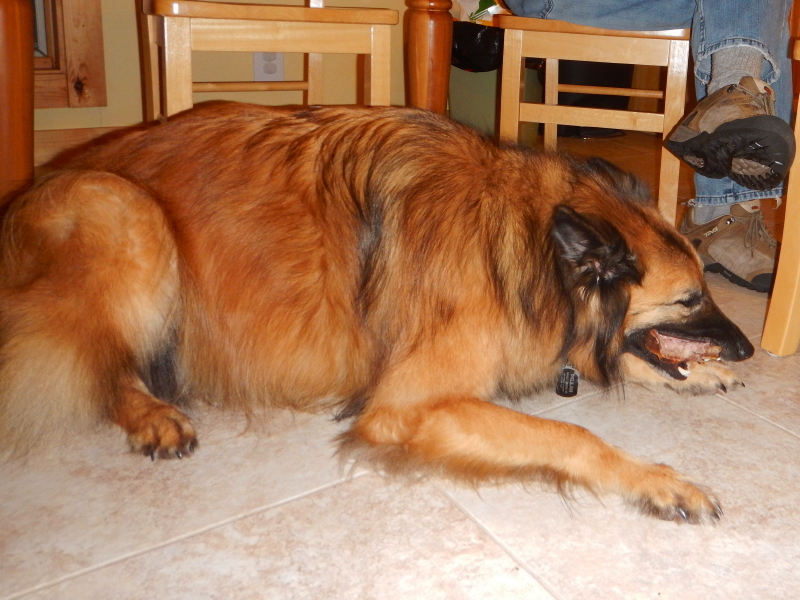 After a fantastic steak dinner, he offered Delilah a bone to chew. I think I noticed her swooning over him. She has a new best friend. At Delilah’s usual bed time, Cyndie put her in her crate and dropped the cover over it, and we moved to the kitchen to play cards. After a short while, Delilah began to whine in her bed. Cyndie decided to give Delilah a little more time with us while we were still up. The dog was as happy as could be over her good fortune. Later, to top off an otherwise stellar day of good behavior, Delilah ended up putting herself back to bed in her crate when she got tired. Cute and very helpful! We are confident she is feeling very, very comfortable here. Goodbye to the year 2015. Bring on the new year, the newest year, 2016! Look out, new year. Here we come.